Disneyland has so much to see and do that most people have a hard time trying to do it all in one day. Juicy Development’s FastTrac claims it can get users on more rides and attractions while avoiding long queue times—what guest wouldn’t like this? But in my experience, FastTrac’s schedule was inefficient, although I was able to get on all the rides it had listed by the end of the day. You start by creating a personalized attraction schedule by selecting the date and the times you plan on starting and ending your day at the park. FastTrac presents a list of all the attractions and rides, and you are then prompted to add which ones you want to fit into your personalized schedule for a day of fun-filled Disney magic. 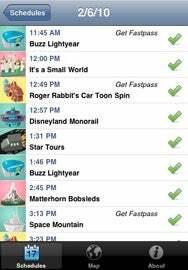 Your schedule can be created before you get to the park, once you get to the park, or even throughout the day. The app uses its built-in “predictive logarithms” to produce a schedule that is supposed to get the user on more rides and attractions during their allotted time at the park. Conquer the Happiest Place on Earth: FastTrac creates a ride schedule for your visit that hopefully won't have you waiting in long lines. When you pick your desired rides and attractions, the rides are not grouped by “Lands” (i.e. Fantasyland, Tomorrowland, etc.) but rather alphabetically. The presented schedule had also eliminated rides that I originally chose—I wasn’t given an option as to what rides it was dropping from the schedule. Continually, the ride order that FastTrac created at times made absolutely no sense, as it sometimes sent me from one side of the park to the other, while passing other rides on my list along the way. For example, FastTrac suggested we ride The Many Adventures of Winnie the Pooh, which had a 10-minute wait and is at the farthest back point of Disneyland. The app then suggested we ride Space Mountain, which is at the exact opposite end of the park in Tomorrowland. On the way to Tomorrowland, you pass Haunted Mansion (which had only a 5-minute wait) in New Orleans Square, which was FastTrac’s next suggestion on the list after Space Mountain. Walking past Haunted Mansion to get to Space Mountain, only to walk back to Haunted Mansion was a waste of time. FastTrac’s biggest achilles’ heel is that it unfortunately doesn’t use live data. It uses historical data, which might not always be accurate due to attendance, weather, or a variety of other reasons. I also was surprised there was no designated time slot in FastTrac’s schedule for lunch or dinner. When is one to stop for food during the day? Eventually, I was able to get onto all the rides FastTrac listed before our day ended, but the app did not produce the most efficient schedule. My entire party felt as though we could have visited many more attractions had we just ignored FastTrac’s schedule and gone our own way.